First it was collusion of Trump with Russians to alter the election, which isn’t a crime no matter if he did. They won’t investigate voter fraud because that would reveal the massive amount of voter fraud committed by Democrats! As it became clear that collusion was a fraud they tried to turn the charge into obstruction as a “process crime.” Because Trump is being completely open allowing Mueller to do anything, including violating the 4th Amendment rights and overriding statutes of limitations to bring charges against Trump members, the only way to charge obstruction is with more lies claiming that Trump lies. Also, you cannot obstruct a fraudulent investigation except in Democrat kangaroo courts. Nor can Mueller indict Trump for any reason while he is president. Only Congress can do so through impeachment. Now Mueller is going after Trump’s children by accusing Donald Trump, Jr. of engaging in conspiracy because he wanted to talk to a Russian woman who said she knew dirt on Hillary. If Donald Trump, Jr. is guilty of conspiracy just for talking to a Russian woman who claimed to have dirt on Hillary but didn’t, then Hillary is ten times guilty of conspiracy working with Russians to sell them Uranium, paying a foreign spy to manufacture the Steele Dossier on Trump, having her husband meet with AG Loretta Lynch while she was under investigation, rigging the Democrat primaries with Debbie Wasserman Schultz, and using the phony dossier to obtain a FISA warrant by which to illegally spy on the Trump campaign! Trump, Jr.’s Russian honeypot was just trying to snag some publicity for her cause. So where is the crime and who is guilty? 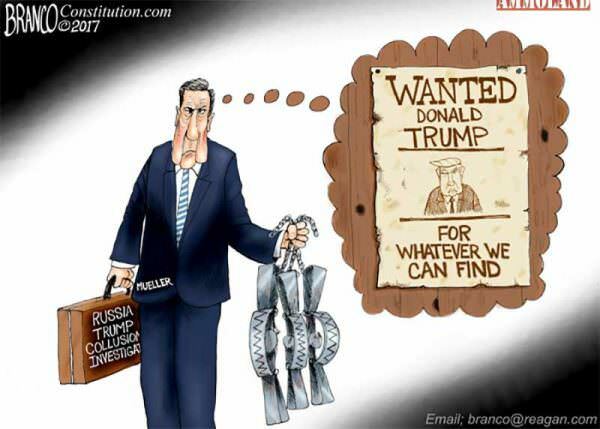 The Mueller investigation has been nothing but a witch hunt to destroy Trump supporters and provide a cover-up to distract from the crimes of Obama and Hillary. AG Jeff Sessions has been sitting on his thumb twirling during all of this. If he doesn’t reveal that he has been secretly gathering the evidence by which to hang Hillary and Obama and company, then he needs to be removed and replaced with someone like Trey Gowdy. Too many Republicans have been working against President Trump to maintain the power of the swamp and these swamp rats need to be flushed out. Wolves in sheep’s clothing are the worst kinds of deceivers. America didn’t turn to Trump because he was what Democrats slander him as being. There are no racists, sexists, homophobes, or xenophobes in the Republican electorate who believe Trump is anything lying Democrats claim. We all know he is the opposite, but that it is they who are what they slander him as being. If Mueller goes after Trump’s son on trumped up charges, then I hope Trump unleashes hell on him by declassifying everything he is investigating. Mueller says such an action would be obstruction. Obstruction? Pfft! Truth never obstructed anything except the ability of deceivers to pull the wool over people’s eyes through their lies!